Idukki is the second largest District of Kerala, with a majority of its area covered by rugged mountains and forests. It is home to Anamudi, the highest peak in South India, and also a dozen other peaks exceeding a height of 2,000 m (6,562 ft). Idukki is one of Kerala’s most important tourist destinations, with Wildlife sancturies, Hill stations, Dams, Tea and spice plantation tours, Mountain treks, Elephant rides etc. It is also a home for large number of tribal population. This district has several protected areas including: Periyar Tiger Reserve in the south, Kurinjimala Sanctuary to the east, Chinnar Wildlife Sanctuary to the north east, Eravikulam National Park and Anamudi Shola National Park to the north, Pampadum Shola National Park to the south and Thattekad Bird Sanctuary in the west. These protected areas are especially known for several threatened and endemic species including Tiger, Nilgiri Thar, Grizzled Giant Squirrel, Nilgiri Wood-pigeon, Elephant, Gaur, Sambar Deer, Purple Frog and Neelakurinji. The most important part of Idukki, this meeting point of three mountain streams namely Mudrapuzha, Nallathanni and Kundala are what gave Munnar its name. Munnar literally means “Three Rivers”. Munnar was the favored summer resort of the erstwhile British rulers in the colonial days. The Neelakurinji, which blooms every twelve years, can be found here. Just 6 kms away from Munnar, Pothamedu offers a panoramic feast for the eye with its tea, coffee and cardamom plantations. It is ideal for trekking. The lake at Devikulam (literally Lake of the Goddess) is a sight to behold. It is one of the most visited places in Idukki. Thumpachi Calveri Samuchayam - Situated on the high ranges, about 12 km from Idukki, Calvary Mount is a beautiful eco-tourism destination. Calvary Mount offers you a calm and quiet atmosphere which can energies the body and mind. The mount also offers every tourists a great trekking experience. The valleys of Calvary Mount also has wide varieties of spices and fruits plantations. Tea, coffee and cardamom are the main plantations in the area. The beautiful view of the Malankara Dam and the backwaters of Idukki makes every visitors feel the great art of nature. The climb to the top of the mount is easy at the beginning but has two steep climbs at the end. There is also a road to the top of the mount which makes the climb easier. Calvary Mount is both a pilgrim destination and trekking spot. The state Forest Department conducts trekking expeditions exploring the wild. This is a Christian Pilgrim Centre and the pilgrims climb up the hill during Lent and Good Friday. The way to the Mountain is graced by the the 14 crosses placed at regular intervals. Tea and coffee plantations nearby makes a great place for the tourists to enjoy a wonderful trekking experience. The scenic beauty of the hills and the valleys refreshes the mind and soul and offers a pleasing sight to the eyes. There are also a few huts for the overnight stay. The facility is maintained by the Calvary Mount River/Forest Protection Council, Nagarampara, Ayyappankovil Forest division. Mattupetty is known for its highly specialized dairy farm named as the Indo Swiss Livestock Project. Over a 100 varieties of high-yielding cattle are reared here. One can visit the place from 7 a.m. till 11 a.m. and again from 2 p.m. too 8.30 p.m. The Mattupetty Lake and dam, just a short distance from the farm, is a very beautiful picnic spot. This place is 13 kms away from Munnar and ideal for adventure tourism and trekking. The fresh mountain air, the foggy hills and the picturesque beauty make the place worthy to visit. This place is based at a distance of 10 kms away from Munnar. This is mainly Located between Munnar and Rajamala. Nyayamakad is a land of breathtaking waterfalls. The waters cascade down a hill from a height of about 1600 metres. 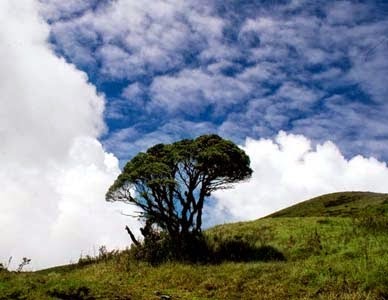 The enchanting surroundings make an excellent picnic spot and trekking point. This is the natural habitat of the Nilgiri which is 15 kms away from Munnar. Half of the world population of rare mountain goat or Hemitragas bylocres, which is becoming extinct found here. The Nilgiri tahrs are today reduced to small herds found in the Eravikulam-Rajamala region. The total number of Nilgiri tahrs in Rajamala is estimated at 1317. The 97 sq. km. park is situated in the Devikulam taluk. The 2695m high Anamudi peak is located in the southern region of the park. This is placed at 15 kms away from Munnar. This waterfall is found out on the way to Thekkady from Munnar cascades down a steep rock and this is placed at 2000m above sea level. The spot is enriched with the scenic western mountain ranges, and is an ideal place for a break on the way to the Periyar Wildlife Sanctuary in Thekkady. This is 18 kms away from Munnar. This place is situated at 22 kms away from Munnar. It is a lush green carpet of tea plants. A trip on the splendid reservoir is a memorable experience. The Tata Tea Plantations and evergreen forests surround the Anayirankal Dam, which is an ideal spot for picnic. Top station: This place is 32 kms away from Munnar. This is placed at 1700 m above sea level; and is the highest point on the Munnar-Kodaikanal road. The rare Nilakurinji or strobilanthus belongs to this region. This plant blooms in every 12 years and filled the hillsides in bright blue. Top Station also offers a panoramic view of the neighboring state of Tamil Nadu. This is 40 kms away from Munnar. This is the only place in Kerala that has natural growth of sandal wood trees. Among the interesting spots in this place some are stated in the following: the sandal wood factory of the forest department, the caves with murals, objects from the new stone age civilization and the children`s park spread across a hectare of land under the canopy of a single Banyan tree. Thoovanam waterfalls and Rajiv Gandhi National Park are also near by to this place. The Cheeyappara and Valara waterfalls are located between Nariamangalam and Adimali on the Kochi-Madurai highway. The Cheeyappara waterfalls descend in seven steps. The panoramic view of this place is awesome and also a great place for trekking. Meenuli: It is famous for two acres of evergreen forests upon a huge Rock. The rock is more than 500 acres in area and is an ideal spot for mountaineering. It is a real beauty as it is placed above the rock. It is situated on the Tamil Nadu Border at 60 kms away from Munnar. This wild life sanctuary is spread across 90.44 Sq. Km. It is an ideal place for one-day picnic. As the name indicates, this park offers panoramic view of the large area of nearby districts and villages. A two-storied pavilion makes an ideal place for enjoying the landscape and beauty of nature. People always come here to enjoy a short stint. This is actually a dam sight, which has a trekking trail. This place has an excellent viewpoint. Kulamavu is a famous hill station in Idukki District of Kerala. Situated at a height of 3,000 ft above sea level, it is an ideal place for trekking and a quiet relax. Kulamavu is in close proximity to Nadukani, which is about 70 km from Thodupuzha. Kulamavu Dam, which extends to 33 sq km, is one of the three dams of Idukki Reservoir Project. St Mary's Church at Pothumattom is a place of worship here. Idukki Arch Dam, Moolamattom underground power station and Idukki Wildlife Sanctuary are the nearby excursions. This place has a scenic beauty, which has a trekking point, evergreen forest. This place is a District Headquarters. This place is the Idukki Arch Dam sight, which has an aerial view of the reservoir. Its scenic beauty is very beautiful at this place. The aerial view of the Idukki reservoir can be seen from this place. The scenic beauty of peaks and forests make this spot a marvelous one. The scenery, which is visible here, is something heavenly. This is situated at 6 kms from Thodupuzha on the Thodupuzha-Moolamattom road. This artificial road is accessible by road only. This place is ideal for boating and fishing. Many tourists come to visit this place only for these attractions. This is situated at 17 kms away from Thodupuzha. There is a 7 steps waterfall, which is lovely picnic spot. At each step of this waterfall there is a cascade and pool beneath. This place named as Thommankuthu is an ideal place for adventure tourism. This place is situated at 25 kms from Thodupuzha. The Rain Bow waterfalls, which flows down a rock from a height of about 1500 m is a wonderful attraction of this spot. It can be seen through out the year in full swing. This place is also important as various medicinal plants grow here. It is an ideal place for rock climbing, mountaineering and camp trekking because of these reasons young people like this place very much. This is placed at 12 kms distance from Idukki. This is located 3125 m above see level from where Kochi, Alappuzha and other nearby towns e.g. Kalvarimount , Peermede ,Thekkady etc. can be seen. By Air Kochi is the nearest airport from Idukki. By Rail Nearest railheads are at Kochi and Kotayam. By Road The important towns of the district are well connected by road.